Alan Grech from Zebbug has taken the plastic recycling Crush and Win campaign above the €10,000 mark after becoming the 100th winner. 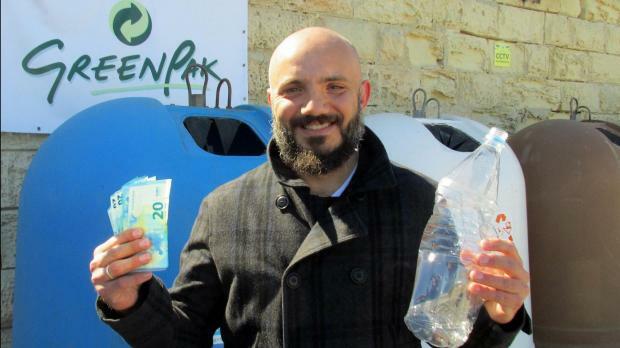 Waste collecting cooperative GreenPak, which launched the year-long campaign last November, is giving away €100 every day to participants who dispose of their crushed plastic bottles or containers in its blue recycling bins day in a bid to reduce littering and incentivise recycling. Since he is the 100th winner, Mr Grech also received a special gift bag made up of items supplied by some of GreenPak’s corporate members including Nestle Malta Ltd, Brincs Biscuits, Pemix Distributors Ltd., VJ Salomone Marketing Ltd, Cassar Camilleri Ltd. Anyone can take part in the campaign simply by writing their telephone number on a plastic container they find outdoors or have at home, crushing it, and disposing of the item in one of GreenPak’s blue recycling bins which can be found at various locations around Malta and Gozo. GreenPak selects one of these discarded bottles or containers on a daily basis and informs the winner that they can collect €100 in cash. According to the most recent figures, almost 60,000 tonnes of packaging material comes onto the local market on an annual basis and 32 per cent of plastic containers are recycled. GreenPak CEO Mario Schembri said: “We are delighted that the campaign is proving to be a hit with the public and that we have already given away €10,000.